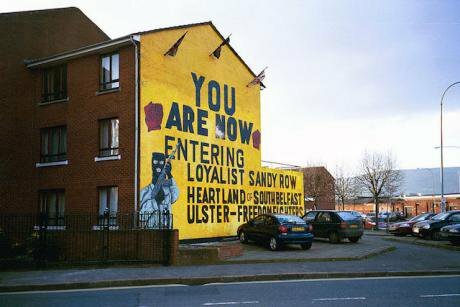 Protestant Enclave of Sandy Row, Belfast, Northern Ireland with UDA/UFF mural on Sandy Row/Linfield Road, 2005. Wikicommons/ Chris Yunker. Some rights reserved.Shortly after Christmas in 2013, I parked my car in one of the back streets of Protestant Sandy Row in Belfast. The area had changed in the nearly fifty years since I first walked there in the early days of the Troubles. Then, back-to-back houses had occupied row upon row. Now, traffic on a four-lane motorway speeds around the city. Yet there was a familiarity. For a few moments I wondered why. Then it dawned. This was the street, now rebuilt with modern houses, where I had visited the boarded-up buildings during the riot torn 1970s. Here, unbeknownst to me nearly half a century ago, was both the ‘beginning’, continuing and ‘end’ of a striving to understand and engage in the ‘things that make for peace’. Throughout those years I have witnessed in many strife-ridden places and communities, a search for peace and reconciliation. Those processes like the Peace Bridge that spans the river Foyle in Derry/Londonderry were complex. Tensions were frequent, often critical, and the tiniest miscalculation capable of bringing down the whole edifice, and destroying years of work. Tensions were frequent, often critical, and the tiniest miscalculation capable of bringing down the whole edifice, and destroying years of work. I recalled too the numerous small groups I have participated in, each struggling to meet Pope Paul VI’s challenge, ‘If you want peace, work for justice.’ I thought about how we sought to move from pasts where suspicion, fear and violence had divided, towards new relationships that made possible a shared future. I remembered just how slow and demanding such activities are: what patience and ongoing commitment they require. I was encouraged too. During Advent 2016, we were privileged to help fund a Youth Initiatives project in Belfast. This was inspired by a sixteen-year-old woman, with the aim of bringing together young people across sectarian and ethnic divides. It is the dream of a ‘shared future’ born out of historic division, with a commitment to dialogue and the creation of joint projects that begin the process of reconciling those formerly divided. For many who read my new book, Things That Make for Peace there will be a sense of: ‘That’s fine for him, but I don’t have his breaks, or influence.’ Possibly, but it was not always so. I have lived longer in the anonymity of working with small groups of people than in the corridors of power and influence. The words of the anthropologist Margaret Mead remain a much more reliable dictum: ‘Never doubt that a small group of thoughtful, committed citizens can change the world; indeed, it’s the only thing that ever has.’ Today I live in a small English country town on a busy road with neighbours who have become friends. Today I live in a small English country town on a busy road with neighbours who have become friends. Together we share each other’s joys and sorrows. I have been struck by how much innate goodness there is hidden among us: the couple who have fostered seventy or so children through nearly forty years; those who take into their care children with special needs. Others quietly raise money for rescue services, or unobtrusively look after elderly but very independent neighbours. Others carry the burdens of loved ones suffering from disability and memory loss, serve in the Food Bank, or visit those in prison. Of course there are prejudices, sometimes tensions, but somehow there is an unspoken feeling of belonging, of community. My contemporary experience of neighbourliness reminds me of working on a south London housing estate with Catholics and Methodists in the 1980s, with people whose lives were blighted by poverty and violence. We had been inspired by work that some of us had engaged with in Latin America, in ‘base’ Christian communities. Together we sought to enculturate what we had learned into our own circumstances. Out beyond ideas of wrong doing and right there is a field. One of the images of salvation in the Hebrew Scriptures is that of entering into a wide open space. In such a ‘space’ there is room ‘to think about compassion for loss, anger at injustice, and the limiting of disgust in favour of inclusive sympathy,’ as the philosopher Martha Nussbaum has put it. But such ‘space’ is not only to reflect on ‘ain’t it awful’ – but to generate ‘Love (which) is what gives respect for humanity its life and aspires to justice and equal opportunity for all and inspires individuals to sacrifice for the common good’. All the great faiths teach us that we are each other’s keepers. Behind every face, there are hopes and aspirations but above all, potential for humanness. For the Christian, Jesus is that person who is hungry; that woman who is confused and naked; the child that is the victim of war. It is such with whom Jesus identifies, because they are truly his fellow human brothers and sisters. Salvation is the entering of a wide open space; a space where the seeking of ‘absolute good’, the work of the kingdom can flourish, and where justice which is the work of peace (shalom) can be found. Jesus’ invitation to his followers, to ‘Set your hearts on his (God’s) kingdom first, and on God’s saving justice’ is an invitation to find in God the origin of ‘absolute good’. In the Hebrew the term for this is sedekah – a concept often translated as ‘righteousness’. When we practise ‘saving justice’ whether by almsgiving, visiting the sick, sacrificing self for others, building peace, we are doing so because we have an obligation under God. It is not something we do on our own, and in Jewish thought, it is not something that is ever complete. We practise ‘saving justice’ as a ‘germ cell of holy discontent, an active leaven in human society’,(8) and indicator of the longed for reign of God on earth. Biblical justice is about right relationships: being right with God, self, neighbour and the environment. What prevents us from being ‘germ cells of holy discontent’ or ‘active leaven’ is fear. Fear is a dominating reality in our world. In the affluent West we fear poverty. In a world of changing values, we fear losing our moral compass. In a multicultural community we fear losing our identity; in a multifaith society, our certainties. We are anxious that if we get too close to others whose faith or values differ from our own we will be compromised. We fear loss of control of our affairs, the respect of others, and being dependent on those we perceive as different from us. In the political arena we look for leadership that is ever more uncertain and fragmentary. We sense a loss of control, insecurity and economic uncertainty. Instead of striving to build a society with others, we crave protection from those not like us. We fear the future. Our vocation as humans, and in particular people of faith, is the creation of a genuinely caring society that demonstrates compassion as one humanity under God. Shortly before I wrote these lines, I heard an account of members of a Jewish synagogue in south London who were converting part of their building into a flat to house Muslim Syrian refugees. They were working on this, as Jews, with Christians and Muslims. By caring for others, and taking responsibility for them, they were also taking care of themselves. ‘Each aspect of peacemaking moves towards the inclusion of the outsider, the overcoming of enmity, and the extension of the kingdom of God to all people,’ observes Willard Swartley. Peacemaking is the primary goal of the kingdom of God, and if we wish to be called ‘children of God’ and be blessed by God, we must dedicate ourselves to this task. In all I have witnessed amongst people seeking ‘the things that make for peace’, it is the dedicated small community of ordinary people doing extraordinary things that remains the most effective. Peacemaking is not simply about ending wars and conflicts on the macro scale. It is recognising those places in our common life where fear becomes the dominant emotion; moments and places where we risk excluding, dominating or otherwise violating the ‘other’, and reducing our common humanity. It is to recognise that peacemaking is a moral commitment. When we seek the establishment of peace, we do so because as Kant wrote, ‘it is the ultimate duty of political action, the highest expression of reason against irrationality.’ We seek peace because the most fundamental human right is to life and it is our moral duty, as Gandhi insisted ‘to struggle against injustice … through the weapon of non violence’. Today few can doubt that our world is a perilous place. Wars, mass migration, uncertainty in international affairs, growing protectionism, the building of dividing walls, whether virtual or real, military threats and political fragmentation, leave us vulnerable to divisions that threaten the very future of humanity. Against such a background to seek the renewal of humanity through the building of small communities seems almost futile. It reminds me of the story of the little bird lying on its back with its feet in the air. Asked by a passing stranger why it was doing that, the bird replied: ‘I heard today that the sky was falling in.’ ‘Well,’ scoffed the stranger, ‘how do you think you can change that?’ ‘One does what one can,’ replied the bird. I talked recently with an old friend, Jim O’Halloran who some forty years ago went to Africa, where together with others he set up the first of what we came to call ‘Small Christian communities’. In the course of our conversation, he told me that today there are some fifteen thousand communities. These groups are based around meeting together, sharing, reading the Bible, dialogue and activities, and, to use Jim’s words, they do ‘anything constructive to build a better world’. Key to such groups were their relationships. I too experienced this in groups meeting on housing estates in south London, Dublin and Belfast, as well as being a privileged guest in other such groups in Brazil, El Salvador, Nicaragua, Costa Rica and Guyana. Like Jim, I too discovered that such group formations were not limited to Christians. In our small group on the Gloucester Grove Estate in Peckham, London back in the 1980s and nineties, word got around of our meeting. All sorts of folks came, individuals who in their own right tried to make a difference, but were ground down by isolation and resistance. With us they found support and encouragement, despite our prayers and biblical reflection. Together we made changes in the community. At different times Jim and I visited India, and here we came across ‘Small Human Communities’ open to people of all religions and no professed faith. Jim reminded me that these were formed largely of women who sought to do practical peace in their communities. One such group living on the street in Bangalore touched me deeply. They had come to identify themselves as a community through partnership with local Christian students who had helped them fund a water supply, by provision of a standpipe. This simple gesture, apparently inconsequential, had opened the door to health care for families, education for children, and recognition that, in their own words, ‘we are now a people’. One example of a ‘small human community’ I experienced in Britain was during the 1980s in the Yorkshire Dales, where a vibrant group of former military personnel, Quakers, and others committed to the pursuit of peace met regularly to ‘Think Peace, Pray Peace, Speak Peace, Act Peace’. I believe that the task of building small groups of thoughtful committed citizens of the kingdom of God is a priority for changing the world, and pursuing the things that make for peace. Many people in our churches, and many who have left them but still hold on tenuously to their faith, are looking for a vision to build a better world. Most know that it will be costly. Ours is a faith that has always held together two apparent opposites: resistance and healing. It is hard to stand against the prevailing mood and culture; to refuse to be fearful when fear is all around us. It is hard to be self-giving, when all around us are self-seeking. It is hard to see others as ‘our concern’, when all around us ‘others’ are a threat and a problem. It is hard to ‘seek peace and pursue it’, when all around defences and weaponry are being built up and stockpiled. But that is the call of the Christ, the Prince of Peace. We are called to resist all the things that do not make for peace and justice. Our vocation is to stand with all those who are poor, vulnerable and under attack. This means being prepared to defend those from different faiths, backgrounds and cultures from our own. It will mean reminding governments of their duty to ‘establish peace’ by building up community, and refusing to play on fear, and seeking to justify the use of state-sponsored violence. This means being prepared to defend those from different faiths, backgrounds and cultures from our own. The communities in which I have found the greatest strength to ‘keep on, keeping on’ have been those most aware of their own need of healing, as much as they have been aware of the need for the healing of the nations. As they have studied Scripture and sought discernment, they have prayed for faith, courage and hope to stand up, speak and act in solidarity for those most in need. On Advent Sunday in 2016, I listened to the moving testimony of a Syrian priest who had been taken from his monastery by ISIS and tortured. Subsequently, in another prison he was confronted by his 100-strong congregation who had been taken hostage. All expected the worst. To their surprise their captors released them, ‘Because,’ they said, ‘you Christians did not take up arms to fight us.’ Of course such a story does not answer nor solve the deep and complex issues that face us, but it does exemplify. My journey of possibilities from bystander to peacemaker grew out of a commitment ‘guided by ethical principles, chastened by the lessons of history, and embodied in the experience of practical peacemaking’. It has been enriched because of those whom I have met on the ‘common ground in the multiplicity of our spiritual and guiding lights’. I have been humbled and encouraged by people of many faiths and none who have ‘fought the long defeat’. Because somewhere in the recesses of my memory stirs the story of the coming of the Prince of Peace, whose Presentation in the Temple I celebrated on the completion of this book. Like the old man Simeon who waited for ‘a light for revelation' – I too wait in hope. This is an extract from Things That Make For Peace: A Christian peacemaker in a world of war by Peter B. Price.